Way back in 2012, just after I got home from the third MathsJam annual conference, I wrote an article about the conference and the pub meets. At the time of writing, I am on a train home after MathsJam VII – yes, that's right, there have now been as many MathsJam conferences as Star Wars films (more if you don't count The Phantom Menace). MathsJam continues to be the highlight of my calendar, and I thought I would share with you a few of my favourite moments from this year's event. But first, let me tell you a bit about the structure of the conference, which is unlike any other I have ever been to. Solving a 2x2x2 Rubik's cube in a word record time of 0.49 seconds! On Saturday afternoon, once a very efficient shuttle service of volunteers had got everyone from the station to the venue, Colin Wright, our host, kicked the event off with his usual instructions to play nice, never spoil a problem for someone else, and most importantly have fun! Then the talks began – lightning 5-minute talks on everything from spirolaterals to boomerangs. As Colin reminded us, 5 minutes is not long enough to teach us something new, just to set the scene, share something cool or set a problem. That's why the breaks are so important – MathsJam works because of the coffee breaks. After half a dozen talks, there's a long break in which you can talk to the speakers from the previous session, try to solve any puzzles that have been set, and play with the many many toys that people bring – wooden puzzles, knitted flexagons, and the ubiquitous ring on a chain trick (if you've not seen it, ask any seasoned mathsjammer…). This year, my talk was on different solution methods and the joy of finding an elegant way to solve a problem. I shared two problems from the NRICH website, Kite in a Square and Making Sixty, and invited attendees to come up with their own proofs and share them with me. I then turned my sixty degree angle into a truncated tetrahedron. Not only did people find new ways of proving the results, someone showed me a way to make an octahedron with my sixty degree angle! Talks finished a little after 6pm, and then after dinner the evening events began. Last year, for the first time, people offered to run table activities in the evening – I ran a knitting/crochet circle and taught some people how to crochet while others worked on their latest geeky craft projects. This year, however, I missed the table activities because of two big events – MathsJam Jam, and Only Connect. MathsJam Jam was a fantastic musical event where people shared songs they had rewritten with mathematical lyrics. There must have been about 30 of us sitting around, some with guitars and ukuleles, singing along to such popular hits as "Scalene" (Jolene), and "Approximate Pi" (American Pie). Then from singing my heart out I went straight through to join the Only Connect team. Six of us formed two teams of three to compete in a special quiz based on the popular BBC show, written and hosted by Katie Steckles and Paul Taylor. Being on the winning team was the icing on the cake for me. 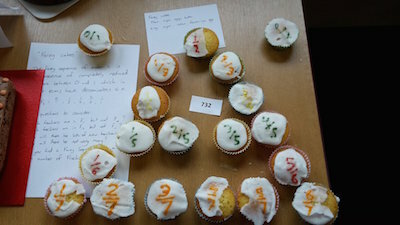 Speaking of cake, this year also saw some superb entries for the MathsJam Bake-off, a competition with prizes for most delicious cake, most attractive cake, and best mathematical concept demonstrated through cake. Colin Beveridge had the brilliant idea of making fairy cakes and icing them with the Farey sequence, and I was only too happy to lend my baking skills to make some buns to carry out his plan. After a late night playing games and catching up with friends old and new, we could have been forgiven for lacking in enthusiasm for an 0850 start on Sunday morning, and yet the room was packed for Christian Lawson-Perfect's talk explaining how he taught a toy horse to count using a raspberry pi. And the talks continued, entertaining, explaining, and inspiring, until it was lunchtime and time to start saying goodbye. As we all made our way back home from Staffordshire, Twitter was alive with people making plans to meet up soon, and sharing ideas from the problems they were solving on the train home. I have a big notebook stuffed with problems to work on over the next few weeks and months. So now it's a year until the next big MathsJam. I find myself wondering what I will do with myself, and how I can wait that long. But then I remember that monthly MathsJam pub meet is only just over a week away, and I will need a good few months to write my talk for next year… roll on MathsJam VIII. Alison Kiddle is a former mathematics teacher and currently works as Key Stage 4 Coordinator for the NRICH mathematics project. This conference generated so much laughter - I quickly realised I must lighten up my own talk. Recreational mathematicians have FUN and most are far from the stereotyped image of the shy nerd; extroverts, performers, jokers, musicians, charismatic characters abounded. The arrangement of sitting around and moving between tables (strewn with games and puzzles) rather than listening in seminar-room rows then drinking coffee in "cliques" made it easy for a newcomer like me to meet many other delegates and to feel very much at home. Thanks Alison, Katie, Paul and many others. Alas my attempt to attend Tuesday's Nottingham MathsJam led instead to two hours stuck in a broken-down train; at least I had time to construct and solve this month's MathsJam Shout problems!